Gladys Hall, 99, passed away on Monday, October 22, 2018, at Westside Garden Plaza in Indianapolis. Gladys was born on September 4, 1919, to the late Cary and Velma Myers. 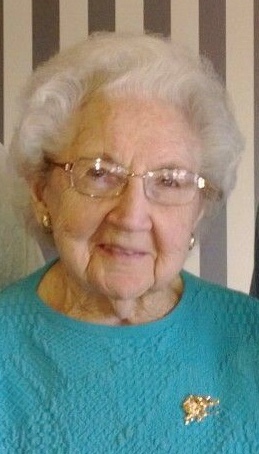 She graduated from Marion High School in 1937. While working at a bank in Marion, Gladys met the love her life, Duane Hall. They were married on September 3, 1947. They celebrated 56 years of marriage before Duane passed away on July 10, 2004. Gladys was a former member of Bachelor Creek Christian Church in Wabash before moving to Indianapolis, where she then became a member of Chapel Rock Christian Church. She was a lifelong member of the Daughters of the American Revolution, serving for 70 years. She was an avid reader who also enjoyed gardening, sewing, baking, and cooking. Gladys is survived by her sons, Darl (Marilyn) Hall, Indianapolis, and Stephen (Sharon) Gilbert, North Manchester; sister, Carolyn Hutchens; nine grandchildren, sixteen great-grandchildren, and four great-great-grandchildren. She was preceded in death by her parents, Cary and Velma Myers; husband, Duane Hall; son, Dennis Hall; four sisters, Georgeanna Cates, Eldonna Bowden, Maryhanna Hosier, and Dorothy Myers; and brother, Phillip "Phil" Myers. Arrangements for Gladys have been entrusted to the College Park Chapel of Armes-Hunt Funeral Home and Cremation Services, 4601 South Western Avenue, Marion, Indiana, where a visitation will be held from 11:00 a.m. - 12:00 p.m. on Saturday, October 27, 2018. A funeral service will follow at 12:00 p.m. with her grandson, Forrest Hall, officiating. Burial will take place at Estates of Serenity in Marion. The family requests that no flowers be sent. Instead, please make a donation to your favorite charity. Online memories and condolences may be shared at www.armeshuntfuneralhome.com.